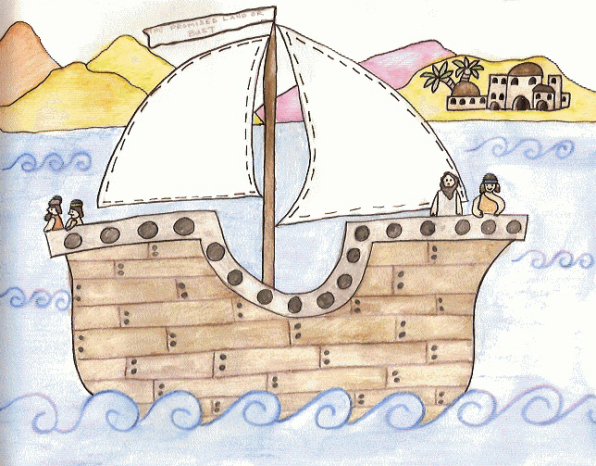 When Titocli was just a small boy, his family sailed in a ship from the Middle East to South America. It took them many long months of rough seas and storms before they arrived. Once they landed, they chose a place to build their new home. 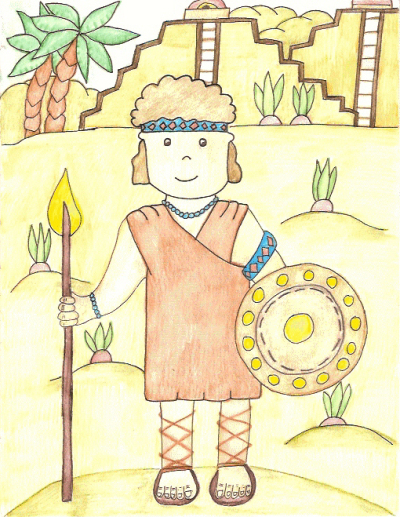 Titocli had to help his father carry wood and carve stones into squares. They saw many strange animals that they'd never seen before; jaguars, coatmundi, puma, alpaca, and llamas. Giant butterflies and brightly colored parrots often flew past them, bringing giggles of joy to the children. After several weeks, they finished building their home. Titocli and his father went exploring, to see what other new and exciting things they could find. At first they rowed their canoe down the river, but when they came upon the waterfalls, they had to pull the canoe onto the banks and walk. The trees grew thick and it was hard for them to see much of anything except vines, monkeys and leaves. Sometimes they'd see a snake slither past. Titocli would run and hide behind his father, afraid of the huge, fat serpents. One morning they came upon a clearing. “Papa, look at those buildings with steps. They look like temples,” Titocli said. Smells of roasting food filled the air and noise roared across the sand. “If we're going to live near the city, then maybe we should have spears and a shield too, to protect Mama and the girls.” Titocli gazed at his father. “Perhaps you're right.” Papa called one of the warriors over and asked where he could buy a shield and spear just like his. The man pointed at a building. “Come, Titocli. We must go over there.” He led his son through the town. When they stopped, Papa asked the man if they could buy two spears and two shields. He sold them his best. They headed for home. Several days later Mama and the girls saw Papa and Titocli coming home. “It's Papa,” shouted Milika. She ran to give him a hug. 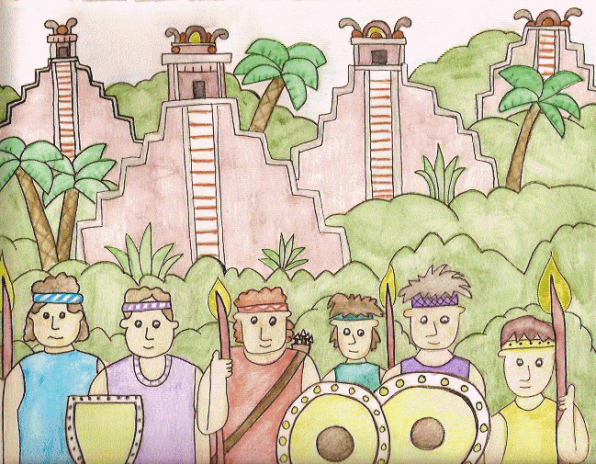 “We found a large city, with temples covered in gold and turquoise and precious metals. Warriors protect the city. Titocli thought we should have some weapons to protect us and I agreed. Many will come to attack the city and try to take their gold.” Papa stuck his hands in his pockets. “I brought you and the girls some necklaces and beads for your hair. Mama showed the girls. They giggled and slipped the necklaces on. Titocli already wore his. That night they feasted on roasted wild pig and fruits that the girls had gathered. The next morning Papa took the whole family to the city. They saw the finery of the wealthy people who lived there. Feathered capes and golden bracelets sold in the markets, along with squash, avocados, yams, beans, plums and pineapple. Baskets of fish stood on the ground, luring all who walked by with their colorful scales. Boxes of hot peppers, garlic and onions tempted Mama to stop. She'd never seen such things before. Papa took them down the road to show them the warriors who guarded the temples. 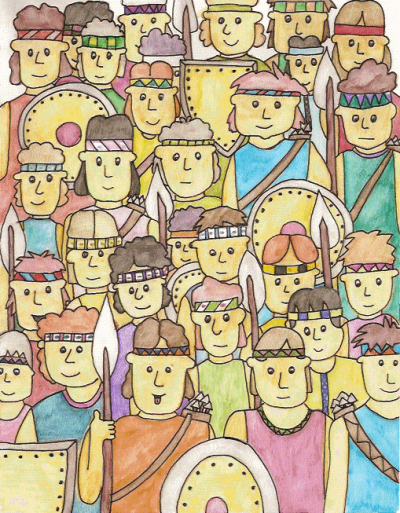 Each of them carried a shield and a spear, or bows and arrows. After they went home, Mama tucked her girls into their beds. Titocli helped Papa build a wall around their home. Mama was glad they'd seen the city. She hoped Titocli and Papa would never have to use their spears. That night, when the stars filled the heavens and the moon glowed, Mama and Papa sat outside, enjoying the quiet of their new home. They missed their old home, but knew that they'd made the right choice by traveling to this distant land to start a new life.